First, the source code for the mini Battlezone arcade machine is now online (GitHub), along with the code for the mini Asteroids arcade. Oh, and one more thing. To keep the audio mixer marching along, we had to connect PC6 to PC7. This ties the I2S MCLK to timer 3 channel 1, which triggers a periodic interrupt that mixes new samples into the audio output buffer. 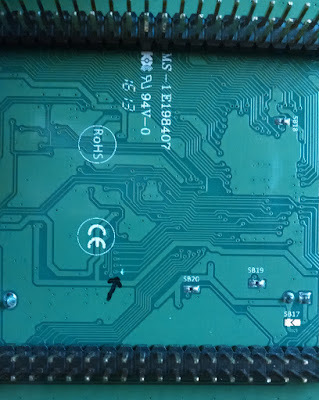 The easiest way to do this is to connect a jumper across pins 47 and 48 on the GPIO header P2. They are clearly marked on the board and the pins are right next to each other so this is easy. Wire up a 4bit ladder dac from GPIOC[3:0] to the ladder dac (curr its either max or 0 in the code). Wiring a ladder dac on GPIOC[3:0] is no problem, but what do I connect the output to? 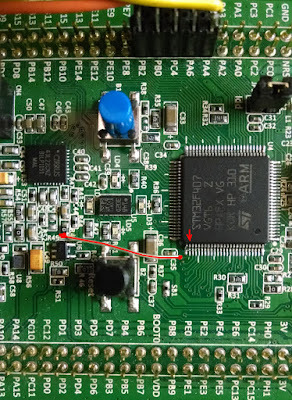 Dave–the 4-bit DAC goes to the video amplifier board. You can get 16 different brightness levels.